SYMPTOMS like severe headache, vomiting and blurred/ double vision only appears after 2nd June 2007. Nurul Islah @ Kak Cik undergo a CT Scan at Columbia Asia Medical Center in Seremban. Dr. Rosdi of Klinik Anjung Karisma in Seremban 2 broke the news to us that the mass shown in the image is a tumor. Went up to Hospital Kuala Lumpur (HKL) to meet a Neurosurgeon Dr. Kantha. The meeting was arranged by Dr. Dilshaad Ali, a good friend from my MERCY days. Dr. Kantha confirmed that there is a tumor at the Cerebellum and it has blocked the Cerebrospinal Fluid (CSF) therefore causing Hydrocephalus and thus the symptoms. Kak Cik underwent a surgery in HKL to put in place a ‘shunt‘ that’ll divert CSF to her abdomen. The surgery which lasted for about 1 hour (from 8pm) was successful in reducing the Hydrocephalus. Special prayers session was held in Salina’s (my sister) house in Bangi. Thank you. She’s not yet discharged but was allowed to return home (on leave). MRI was done at about 7.30am. She was then discharged at about 3pm. Today I was rather disappointed with one particular Oncologist at the Paediatrics Institute of HKL. I might want to write a bit about this incident later on. 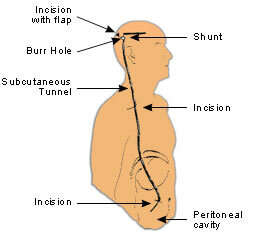 From the look of it, a major surgery will have to be performed to remove the tumor. We are however very grateful to Dr Kantha for taking his time to explain about the situation and for being understanding about our anxieties. He allowed to go home to seriously consider the situation and maybe get a second opinion before committing to the surgery. Today is a special because Nur Baiyyinah, our eldest daughter is enrolling into the Foundation Studies (Matriculation) of International Islamic University of Malaysia’s law program in PJ. She had always wanted to be a lawyer and to study in IIUM. Today, we were also referred to a top Neurosurgeon in private practice for a second opinion. He was very nice and sincere but his analysis of the MRI was very nerve wrecking. He said that he’s almost certain that the tumor is Medulloblastoma, a malignant and fast growing tumor. He also said that without surgery, it could be just matter of weeks before Kak Cik’s survival will be at stake. He however mentioned that the success rate of such surgery is about 90% but the 10% failure rate plus the associated risks are also very real. Met with Dr. Azizi Abu Bakar, a highly recommended Neurosurgeon in HUKM. He explained again about the surgery and we finally agreed to proceed. It was then scheduled that the surgery will be on 4th July 2007. It was however brought forward to 2nd July 2007.